June | 2015 | NFL News, as it happens, when it happens. Your one stop shop. It’s a new year and a completely different secondary for the Patriots. Last year was amazing and no true Pats fan will ever forget it, but that was then and as Bill says we’re on to 2015. Forget about Revis, forget about Browner, time for the next men to step into place, do their job and lock down the aerial attack. Easier said than done when you lose the biggest physical corner in the league in Browner and arguably the best 1 on 1 shut down defender the league has seen over the last eight years since his start in the NFL. However this year’s secondary could be just as good if not even better. The savior of Super Bowl XLIX Malcolm Butler made the single best play of his life but now he will be a starter and that’s a whole new ball game. As an undrafted free agent last year Butler was used scarcely in a loaded Patriot secondary appearing in 11 games and starting in just 1. Based on the few practices the Pats have had this year in OTA’s they have used Butler on Edelman, clueing us in that they see him as the lockdown corner of the roster. He will be asked to shut down the best WR of all Patriots 2015 opponents including Antonio Brown, Sammy Watkins, T.Y Hilton, and Dez Bryant and that’s just in the first five games. In the eyes of Pats Nation if he can single handedly win the biggest game with one play then he has the potential to fill the shoes of the 6x Pro Bowl CB Derrelle Revis. The Patriots chose to roll the dice and let Brandon Browner test the free agent market, who ultimately signed with the Saints for a bigger payday than the Patriots were willing to give the penalty prone DB. Bradley Fletcher will more than likely get the CB2 position to start the 2015 year. The former Iowa Hawkeye and veteran of 6 full seasons with the Rams and Eagles has pulled down 8 interceptions in his career, with his best pick totals coming in 2010 when he pulled down 4 balls. Fletcher (28yrs old) is a solid CB poised for a breakthrough season with the defending champions. 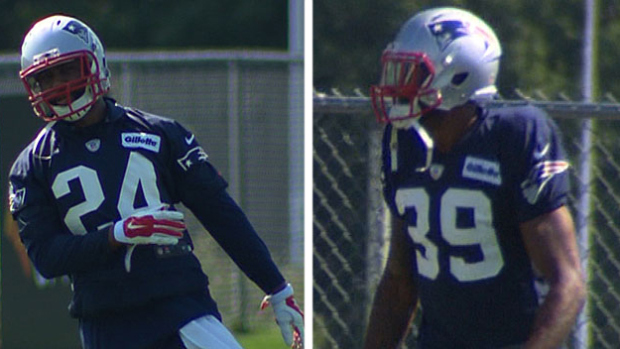 Returning Safeties Devin McCourty and Patrick Chung (each 27 yrs old) are entering their prime football years. These two men aim to secure the potential deep threat against the Patriots in 2015 and are the strongest, most reliable pieces that the New England secondary has. The hard hitting Chung has to improve his on-ball coverage skills and protect the over the top bombs that QB’s have know to be a vulnerability of Chung’s in the past. As well McCourty needs to lower his shoulder and put the pounding on opposing WR going over the middle and put that fear into their eyes. If these men can help teach each other the best parts of their game the safety duo have the potential to rival any other in the history of the NFL. Possibly the biggest strength to this year’s Patriots secondary is the improved front seven. With key additions like Jabaal Sheard, rookie big man Malcom Brown and the healthy return of Jerod Mayo, youngster Dominique Easley, New England’s pass rush is sure to pick up tremendously. Also the improved play of Chandler Jones, Dont’a Hightower and Jamie Collins (all 25 yrs old) is sure to spell disaster for opposing offences all over the league. The best friend to this year’s Patriots secondary will be a strong presence in the backfield. This core of young studs and solid veteran leadership is sure to set the New England defense up for great success in 2015 and years to come.